Top training providers and colleges still denied non-levy contracts are turning to influential MPs in an effort to squeeze the cash they need from the government. Exeter College, which FE Week rates as the best college in the country, and Hull’s HYA Training both appealed the ESFA’s decision not to fund their apprenticeships with smaller employers before Christmas. These appeals were swiftly denied – even though the two providers are respectively rated grade one and two by Ofsted. 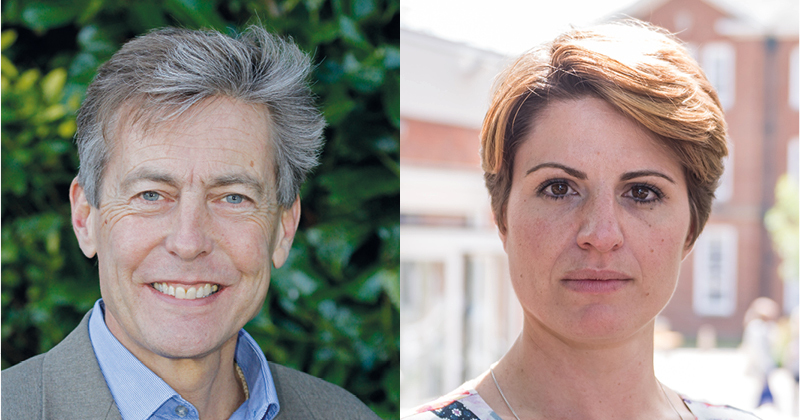 Determined not to give up, Exeter College has now turned to its influential local MP Ben Bradshaw (pictured above left), a former culture, media and sport secretary and shadow deputy prime minister, to take the battle to Whitehall. HYA Training is meanwhile liaising with its own MP, Emma Hardy (pictured above right), who sits on the education select committee. Mr Bradshaw has already written to Anne Milton about the damage the decision will cause if it is not overturned. “It is inexplicable to me that the top-performing college in England, with an excellent record on delivering apprenticeships, has lost out in this way,” he told FE Week. Exeter College has an 81-per-cent overall apprenticeship achievement rate, well above the national average of 67 per cent. “We are currently exploring all available options to resolve the present situation,” said a spokesperson. Another high-profile organisation denied a contract in the non-levy tender was children’s charity Barnardo’s. The provider is rated ‘good’ and has 30 years’ experience in delivering apprenticeships to the UK’s most vulnerable young people. It appealed the decision before Christmas but Ms Milton stuck to her guns. A spokesperson for the charity said it would continue to support vulnerable young people into apprenticeships with smaller non-levy employers by becoming a subcontractor to other organisations, “albeit with reduced funding”. Patrik Knowles, the managing director of HYA, has sought legal advice, complaining that the non-levy tender was unfair and represented more of a lottery than a procurement process. His provider, like Barnardo’s, passed the score criteria but fell below the £200,000 threshold the ESFA uses to apply its pro-rata methodology – a rule which applicants did not know about until the tender results were released. This “lack of clarity only left everyone second-guessing”, Mr Knowles wrote in an article in last week’s FE Week. Ms Hardy said the entire system of apprenticeship funding needs to be more transparent, and wants powers to be devolved to allow local commissioning. Newcastle and Stafford Colleges Group, another ‘good’ provider denied a non-levy contract, is still in the midst of its appeal, and is “hugely encouraged” by the level of support it has garnered from its local MPs. The college’s chief executive, Karen Dobson, said she remains “hopeful” that a “satisfactory outcome will be reached in due course”. The much-delayed procurement process has tormented the sector all year and ended up causing huge controversy when results were released in December. One of the most frustrating cases was revealed by FE Week when we found one organisation that had ceased trading in October was awarded a contract in the procurement. A total of 714 providers were given allocations to use between January 2018 and March 2019, but 227, nearly a third, are on their first direct apprenticeships contract.